I have updated the trip planner for the BJCTA Max buses to include new routes. The 41 Fairfield has been completed. You can download the data off of the GTFS Data Exchange. My Trip Planner already includes the latest data. Or you can download my Android App for free from below. If you have an iPhone, you can download a 3rd party app called Hop Stop. I have updated the trip planner for the BJCTA Max buses to include new routes. 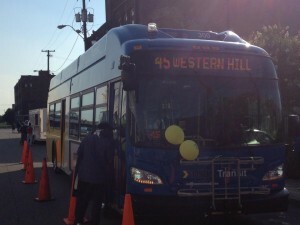 The 1 Express, 45 Express, 44 Montevallo, and 6 Pratt-Ensley have all been completed. You can download the data off of the GTFS Data Exchange. Google has recently updated all their imagery for Google Street View in Birmingham, AL. Not only are the images much higher quality, but they have expanded their areas of coverage too. This is great news for my Bus Stop Cataloging project! This will make it much easier to use my StreetView cataloger website. It is now easier to see the bus stop posts, the data is more recent and therefore more accurate to some of the newer route changes, and it covers more areas which means I can finally go back and fill in those missing spots! If you’d like to help out, please visit my StreetView Cataloging website and start finding bus stops!